Racha Yai and Racha Noi Islands are located approximately 25 Km (15 miles) and 40 Km (25 miles) south of Phuket respectively. Koh Racha Yai, which in Thai means “the big king island” is inhabited with several resorts and restaurants and quite busy with sightseeing, diving and snorkeling day trip boats. It offers a few nice and easy dive sites perfect for beginners, training and check-dives. 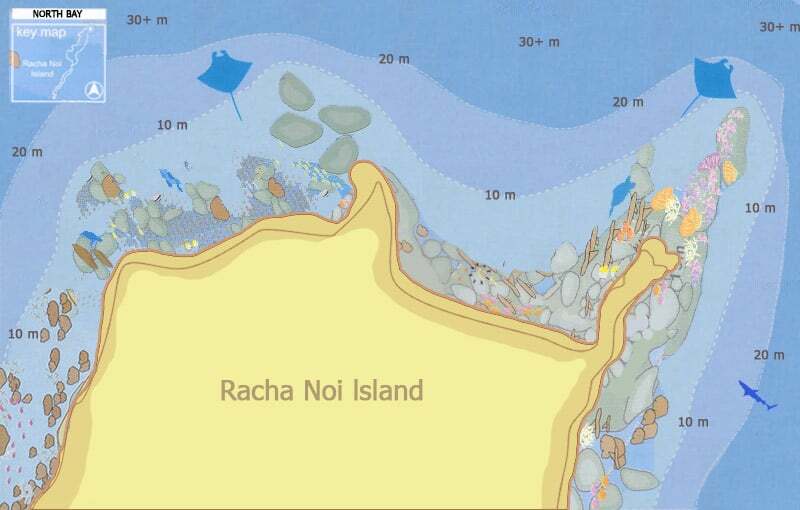 Racha Noi Island (the “small king island”) is completely uninhabited and unexploited, and much less busy than its “sister island” due to the more remote location. 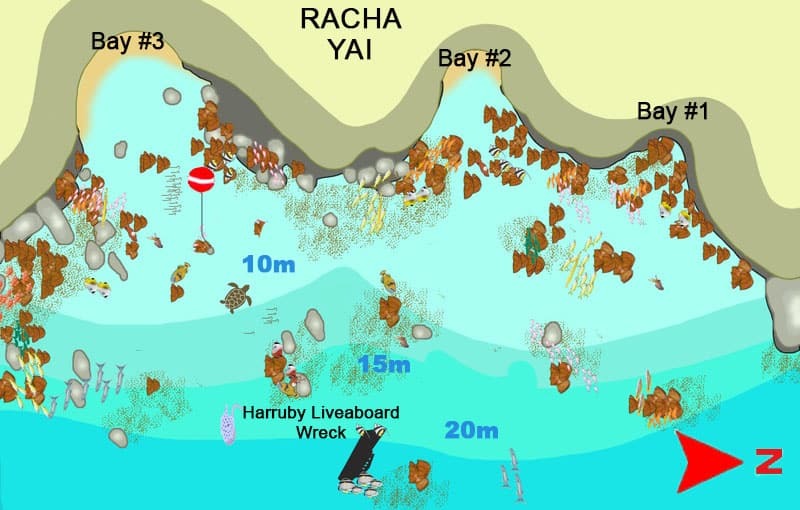 Only a few dive boats and speedboats go to Racha Noi every day and the island offers more challenging (and interesting) dive sites compared to Racha Yai. Both islands are mainly made of granite rock and characterized by very clear water, providing perfect conditions for diving. 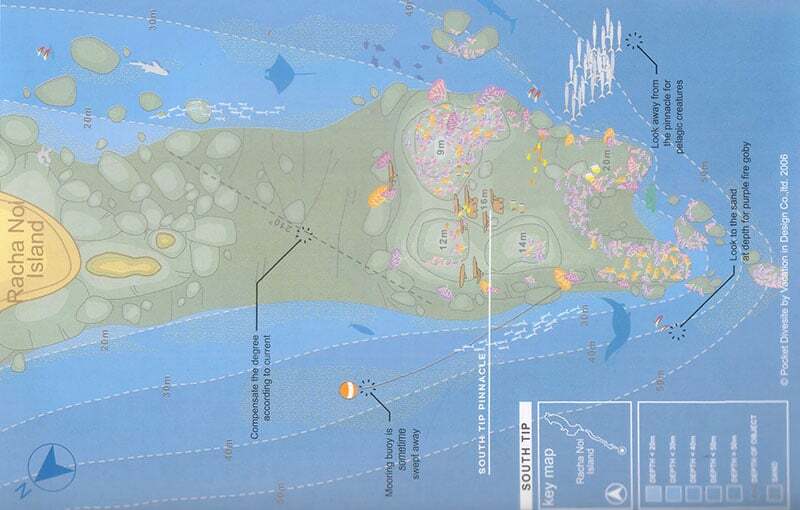 See below all the Racha Islands Dive Sites covered by MV Giamani liveaboard. 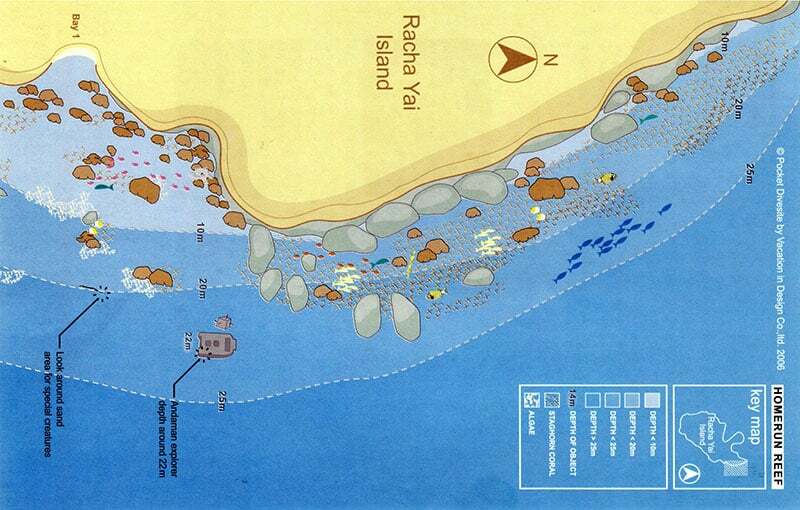 The three small bays at the northeastern side of Racha Yai Island are commonly referred to simply as Bay Number 1, Bay Number 2 and Bay Number 3. The whole area makes a nice dive site perfect for the first dive of the trip, as the conditions are usually perfect with good visibility and no current. The dive site included an artificial reef, a sloping natural reef with nice hard corals, and also a small shipwreck. North Bay, as the name suggests, is located at the northern tip of Racha Noi Island. The dive site offers a few different variations suitable for all levels of divers. The bay is quite shallow, the west side has a sloping reef with very nice hard coral and rock formations, while the east side has a rocky pinnacle that extends from the island all the way to over 40 m depth. Banana Bay is located on the eastern side of Racha Noi Island and one of the easiest dives in the area, perfect for beginners or for the fourth dive of the day where we limit the depth. The hard corals on the south end of the bay are in pretty healthy conditions, providing the basis for an enjoyable dive for any level of divers. Racha Noi Bay is a beautiful, postcard-like spot, at the southern end of Racha Noi Island and is one of the top Racha Islands Dive Sites. 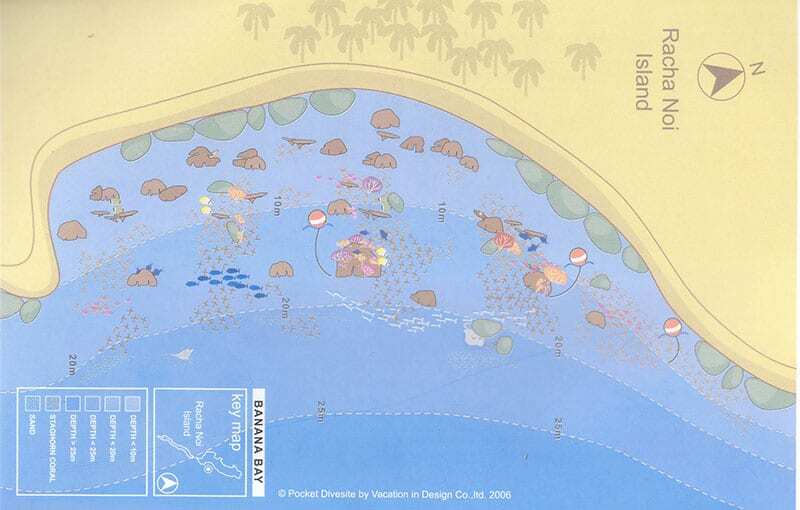 As it can be seen on the map, the bay has a white sandy beach with a sand stripe that extends to a small islet surrounded by a rocky reef. 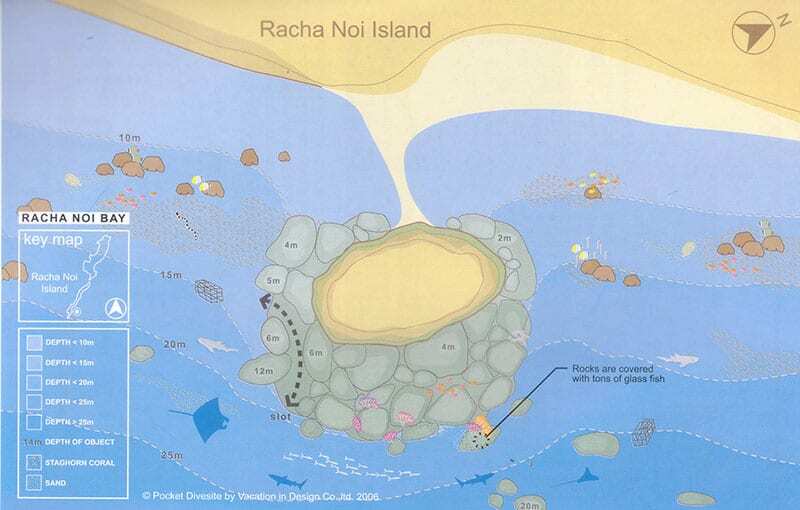 This is usually a drift dive around the outer side of the rocky islet, with direction based on the conditions of the current. South Tip is the dive site at the southernmost point of Racha Noi Island, and it’s considered the best dive site in the Phuket area to see manta rays. The dive site consists of an ensemble of submerged granite boulders protruding further from the island. Due to the pretty deep average depth and exposure to strong currents, this dive site is suitable only for experienced divers and possible to dive only with optimal sea & current conditions.